SCANZ stands for “Solar Circuit Aotearoa New Zealand.”This means it is a child of Polar Circuit artist residency, which was held in 1997, 1998 and 2000 in Lapland in the Northern Hemisphere close to the arctic circle and was styled as a kind of ‘anti-biennale.’ It occurred in a regional location not an urban centre; it understood the role of social gatherings at conferences where some of the important discussions take place not in the main auditorium but over coffee. And it was founded on a concern for the environment. There was a Solar Circuit in Tasmania in 2002, which Ian Clothier attended. There he met Nina Czegledy (actually at the airport in Melbourne waiting for the Hobart flight). Part of the Solar Circuit occurred on Maria Island, a bird sanctuary. 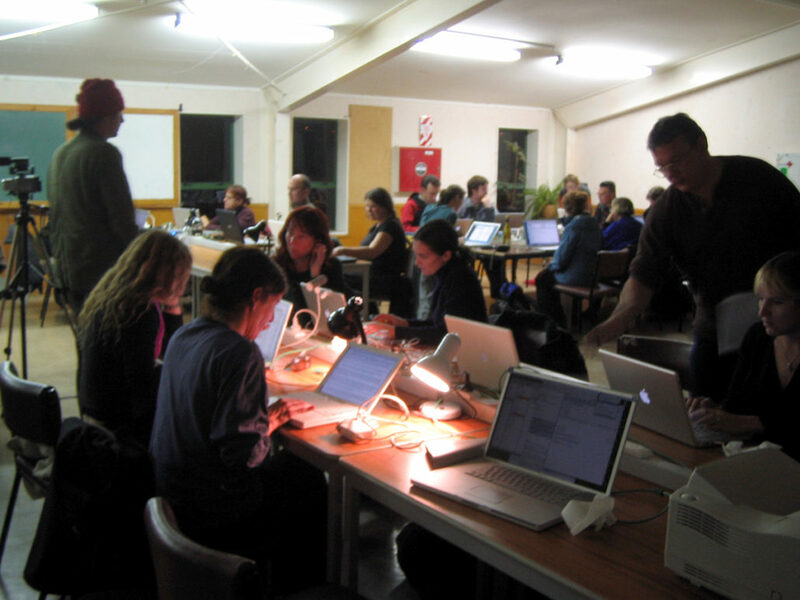 It was considered that Nga Motu New Plymouth would be a good location for a Solar Circuit, and in 2004 Clothier wrote to the Aotearoa Digital Artist (ADA) list seeing if anyone was interested in organising a residency, and Trudy Lane put her hand up. Through 2005 the project was developed and applications made and the first SCANZ occurred in July 2006. Adam Hyde was a key part of the core team, and set up the space N2 ready for the residency. In many ways the four organisers of the first SCANZ were Ian, Trudy, Nina and Adam. ADA also held their AGM as part of SCANZ2006. After reflecting on the first event, it was decided to move to summer mainly for access to the mountain, and the second SCANZ – Raranga tangata – happened in the summer of 2009. Thereafter SCANZ was held in 2011, 2013, 2015, 2017 and one is proposed for 2018. The project consisted of a powhiri (welcome) to Taranaki at historic Owae marae, the residency, the AGM of ADA and the presentation of projects during the hui (symposium). Click here for the pdf of the publication. The phrase “raranga tangata” had been adopted by Sally Jane Norman as a key creative premise. It means ‘the weaving together of people’ which was how Charlie Tawhaio characterised the internet. Eco sapiens was organised with Trudy Lane at the helm. The hui was at the start of the event, and included noho marae – overnight stay at Owae, which had a profound impact on those attending. There was also a strong element of science in the blend of attendees. Six presentations from international people including indigenous located near the arctic circle were given. After the visit to Parihaka in 2013, Inahaa Te Uurutahi Waikerepuru and Ian Clothier were talking about the next event and the how to make it more relevant to the community of Parihaka. It was already decided that water or wai would be a theme for SCANZ2015, following from the Wai exhibition in Albuquerque for ISEA2012 as there had been no Aotearoa event around wai.